It would come as a surprise to most Canadians that we have coped well with the addition of 13 million consumers since 1970. Yet with trans-oceanic vision, Professor Peter MacDonald, sounding less like a demographer and more like a growth-obsessive economist with rose-coloured glasses, confidently asserts that to be the case. In fact it is not. At least three government-funded studies---Report number 25 from the Science Council of Canada, a 1990 report from the Privy Council and the damning Healey report of 1997----all documented the devastation wrought by population growth on our arable land and ecosystems. Our largest cities are bursting at the seams with congestion, smog, overloaded infrastructure and unaffordable real estate. Built-up development pressures have overwhelmed urban boundaries and claimed 20% of our best farmland for housing to accommodate a largely foreign-born demand. According to Ontario Farmlands Trust, Ontario alone lost some 600,000 acres of prime farmland in the decade following 1996. Strict land use planning is typically touted as the panacea for this runaway population growth, but smart growth strategies have been a proven failure. The reality is, as York University Professor Robert MacDermid established in his report on municipal campaign financing in 2009, civic election campaigns are essentially bankrolled by corporate money, most of it from the same developers responsible for the cascading sprawl. The local planning department is, for all intents and purposes, a branch plant of the real estate industry. No wonder that the folks who underwrite home purchases, like the CEO of our goliath Royal Bank of Canada, Gordon Nixon, have lobbied for an immigration quota 50% higher than its current stratospheric level. More homebuyers, more profits. And the ecological costs can be expiated by discreet donations to high profile environmental NGOs like Nature Conservancy Canada or the David Suzuki Foundation, which naturally, have nothing to say about the negative environmental impact of mass immigration nor about the morality of accepting corporate donations. Tovey and MacDonald have it dead wrong. In Canada we have not managed growth. Growth has managed us. Josephine Tovey claims that Canada is some kind of success story for having gone from a population of 21 million in 1970 to 35 million today. She is roughly correct in saying that Canada's population has grown, but she and demographer Peter McDonald should be very careful about saying that any country's population increase (Canada's or Australia's in particular) should be characterized as a "sucess story". Canada and Australia are similar in some respects: both are large areas of land, but Nature has imposed severe limitations on them. Both have huge desert areas : Canada's is in its north ; Australia's is in its Interior. In addition to desert, remember that almost 40% of Canada is north of the 60th Parallel and has to deal with extreme cold and 8 to 10 month long winters. Remember also that Canada, in contrast to Australia, has a river system in its Interior and that that system, in part, has enabled Canada to support its population increase. The question Ms. Tovey should ask is this : Why should any country have a larger population? Canadians who have lived in southern British Columbia and Southern Ontario, the areas of Canada that have experienced high population growth, will tell you that those places have not been "improved" by bringing in more people. In fact, they are "full". In support of that claim, Ontario's Environment Commissioner has stated that Southern Ontario does not have the water to support the planned population increase there and that its river systems cannot handle the wastes from that population. Ms. Tovey should note that in 1976, Canada's federal government asked The Science Council of Canada, Canada's most eminent scientists, to make recommendations about an optimum population for Canada and how Canada could best use its land base and its resources for itself and for its role in the world. That group stated that Canada had to discard two myths about itself One was that its large land base meant that it could take unlimited numbers of people. To help end that misconception, it recommended that Canada restrict immigration and stabilize its population at roughly what it is now. The other myth was that Canada had infinite resources. To assist in ending that myth, it produced rsearch to show that Canada had a finite resource supply and that it should take measures to protect those resources, particularly its farm land. It recommended that since there were few food-exporting countries in a world with an increasing population, Canada should concentrate on becoming a major food exporter. Since then, Canada's real estate and immigration industries have convinced our federal government to ignore much of what The Science Council recommended. As a result, Canada has lost huge amounts of the country's best farmland in southern Ontario to immigration-driven housing development. One event precipitated that loss. Canada's Progressive Conservative Party began an immigration intake policy of 240,000 in 1990, contrary to the advice they had been given that immigration produced alomost no economic benefits and that it would not solve aging population issues. As senseless and incredible as it may sound, Canada's Immigration Minister in 1990 stated she was raising immigration levels (which were around 85,000 when her gov't took office) in order that the Progressive Conservative Party could compete with its rival, the Liberal Party, for the immigrant vote. Even more incredibly, that policy has been virtually institutionalized and all of Canada's federal political parties now support it. Over 5 million immigrants have entered Canada since then. They are responsible for around 70% of Canada's population increase. In other words, Canada has regularized population insanity. Contrary to what demographer Peter McDonald says, Canada is falling into "a big heap". Canada's immigrant visible minority has become the proverbial tail that wags the dog. Immigrant advocacy groups and their converts parade around the country evangelizing for the Religion of Diversity. The reality is that according to one academic, immigration has become a huge economic drag of over $20 Billion a year. According to many others, immigration-driven population growth is transforming many areas of Canada into a virtual social and environmental disaster-in-progress. If Australia thinks Canada is a "success story" to imitate, then go ahead. See you in the asylum !! consulted anyone about the cost of this rampant population growth. dependable agricultural land have been converted to urban uses. water resources in these areas are already being utilized to their fullest. benefiting from cheap labour, as well as the "immigration industry." received so little coverage in the Canadian media. Canadians have successfully managed a similar swelling in population numbers. Josephine Tovey explains five things Australia must do to cope with an extra 14 million people. How does a Western country used to low-density living, with an abundance of space but little arable land, create liveable cities while undergoing a population explosion from about 20 million people to 36 million in 40 years? That is the conundrum now vexing Australia. But Canada has undergone that change in the last 40 years and it is one that experts in population and urban planning say Australia could handle too, if the growth is well managed. ''Canada didn't fall in a big heap because its population went from 22 to 35 million,'' Professor Peter McDonald, director of the Australian Demographic and Social Research Institute, said. Its population has grown from about 21 million people in 1970 to almost 35 million today - roughly the same rate of growth projected by federal Treasury between now and 2050 for Australia. Coping with such growth comes down to long-term planning and attention to key areas, Professor McDonald said. These include creating mass transit systems for expanding cities, providing housing where it is needed, addressing environmental needs like water, food and energy, and directing infrastructure into smaller towns that can share the population growth. Canada's population is spread across a lot of medium-sized cities -more than 33 have a population above 100,000, but only one, Toronto, has a population of more than 5 million. Providing affordable housing will require a mix of high- and medium-density infill, as well as new homes on greenfield sites. ''There will be a strong demand for medium- and high-density housing,'' said Professor Peter McDonald, particularly from migrants. Better water savings measures, such as low water use toilets and showers, are needed, says Grant Leslie, the manager of the Water Services Association of Australia. Desalination plants, new dams and water recycling plants were also part of the solution, he said. Homes and businesses will need to become smarter with their energy use. ''Many areas of our economy use much less energy … that's a matter of replacing more of our fossil energy sources with renewable sources,'' said demographer, Professor Graeme Hugo. Tried - and NOT True.. Pop Growth a Cancer! It would come as a surprise to most Canadians that we have coped well with the addition of 13 million consumers since 1970. Our largest cities are bursting at the seams with congestion, smog, overloaded infrastructure and unaffordable real estate. Built-up development pressures have overwhelmed urban boundaries and claimed 20% of our best farmland for housing to accommodate a largely foreign-born demand. According to Ontario Farmlands Trust, Ontario alone lost some 600,000 acres of prime farmland in the decade following 1996. If Australians think that there is any doubt as to whether a massive population intake would be beneficial or not - please take note of what's happening to other nations - and vote to stop the rot! On population, is Australian the NIMBY nation? Unless we have stability in both our own numbers and in our economy, we will be in no position to send aid or accommodate refugees and support humitarian causes. Globalisation has meant that national problems have become globalised! 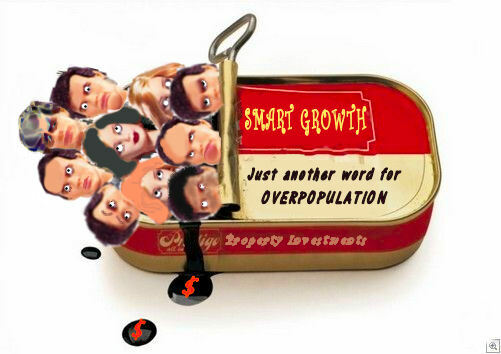 Instead of nations with runaway population growth being forced to support themselves and adjust their living standards and family sizes accordingly, they have the option of international aid and/or immigration/asylum seeker status. NIMBY-ism isn't misanthropic, but about sensible and sustainable populations. It is about resisting commercial forces that promote "prosperity" from population growth, religious fundamentalism, and lack of facilities for family planning. Unless we resist the forces trying to make us feel guilt about being "NIMBYs", then we ourselves will be absorbed into the global threats instead of being part of the solution!